All SEM and EDS systems need calibrating. EM Resolutions Ltd offers high quality resolution standards in combination with a QCT (Quality Control Test) block from MAC, containing your choice of EDS standards. These can be selected from an extensive range of elements from across the periodic table. 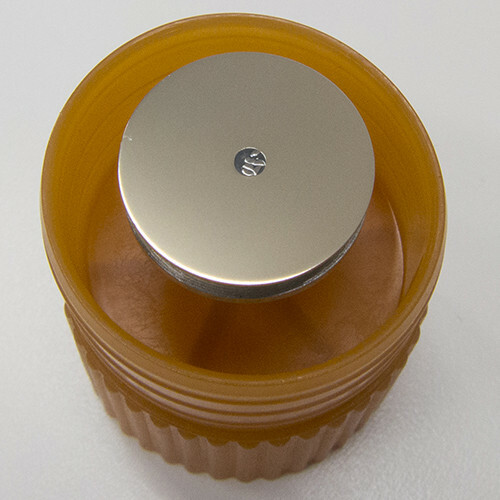 Each standard block has dimensions: 32mm diameter x 8mm thick and is supplied with a Faraday Cup for accurate probe/specimen current measurement and a silicon grid magnification standard to allow for calibration of magnification levels within a SEM. For resolution testing we include our Gold on Carbon resolution standard with or without a Tin on Carbon resolution standard. 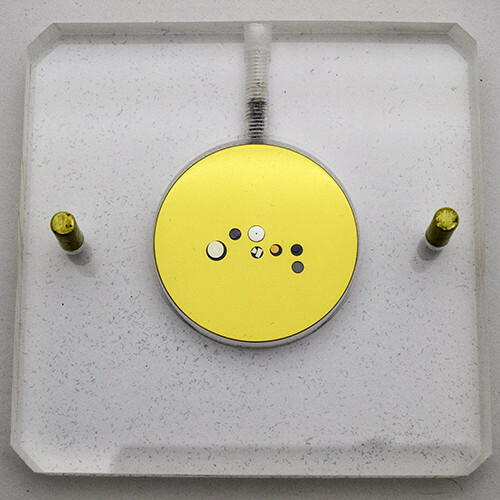 We can provide Gold on Carbon test specimens which are suitable for SE and BSD imaging in a range of sizes depending on the resolution performance of your microscope. 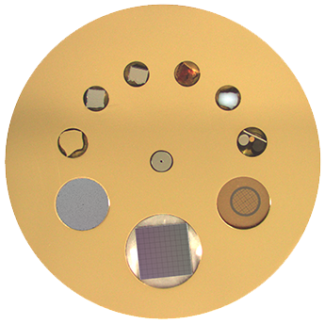 Please see our SEM resolution standards page for more details or call us on 01799 522500 or by email to discuss your requirements and pricing. 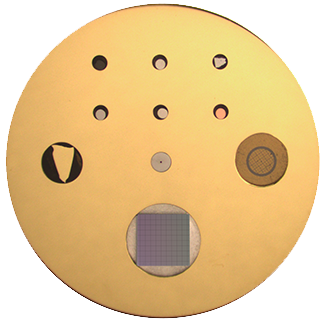 The BSD reference standard is used for checking the contrast efficiency of Backscattered Detectors. Each of the reference specimens consists of two high purity elements that have an atomic number difference of 1. Having a stable probe current is vital for achieving repeatable analysis results. 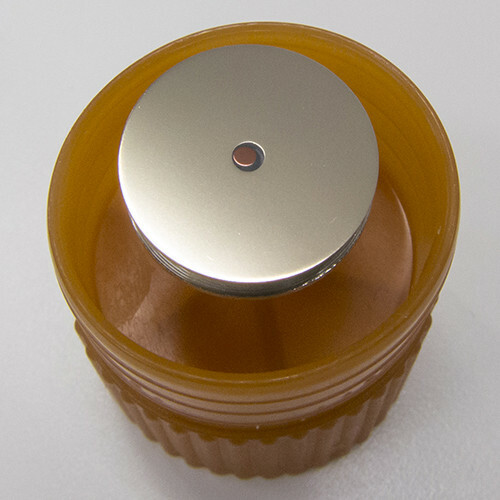 The Faraday Cup has a hole size of 150um and is used for measuring the beam current at the specimen plane. The beam of electrons is focussed inside the hole by increasing magnification so that all the electrons are trapped when the hole fills the screen and a true measure of current is acheived. Also available to order as individual elements of known purity. Available on the stub of your choice. Each EDS standard block goes through a series of rigorous checks before being carefully packed and shipped to the user. Silica gel is used in the packaging to keep moisture at bay. A block layout diagram is supplied with each re-polished standard, together with a summary sheet of the final inspections and tests. 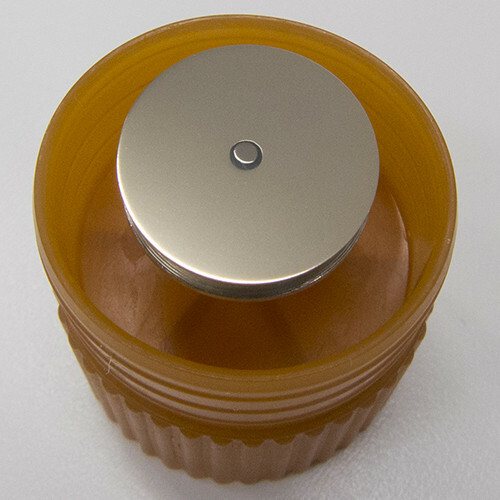 The final polished block is the result of a series of diamond polishes, ending with a fine 0.25um finishing polish. Each standard is coated with approximately 25nm of carbon. As the surface is polished to such a high degree any rubbing from the softest of tissues can damage it and remove the carbon film. The surface of the standard should not be touched or interfered with in any way. The standard is packed in a dust free environment. Any dust that settles on the surface during or after can can be removed using a gentle air jet. Ultrasonic cleaning should not be used as it is too rigorous and will result in damage. When not in use the standard should be kept under vacuum in a dessicator. It is recommended that EDS calibration standards are returned for re-polishing every two years. EM Resolutions can arrange for your EDS standard block to be re-polished and coated. Please contact us for further details or to discuss your requirements.